Marianne from I Like Markers really outdid herself this time, sending me a load of Copic Markers, Multi Liners, Drawing Pens, and Sketchbooks to test out and giveaway. The markers are the cream of the crop as far as art and drawing markers go, and since I am not much of an artist myself, I figured I would try to get these in the best hands possible. 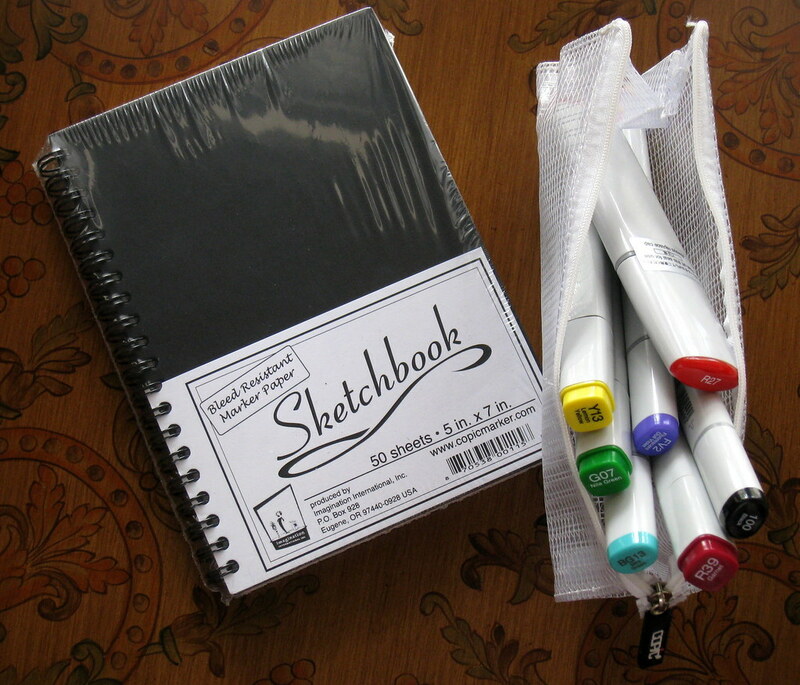 This giveaway is for all of the markers, carrying case, and sketchbook shown in the photo above. One person will take away the entire kit. But this isn't going to be a standard Pen Addict giveaway - you are going to have to earn these sweet goodies. Since I want to be sure that these markers get into the hands of someone that will really use them well, the rules are going to be a little more strict for this giveaway. Don't worry if you don't qualify this particular one - I still have the Multi Liners and Drawing Pens to giveaway, which I will do soon in the regular fashion. PLEASE READ THE RULES CAREFULLY!!! 1. I am going to need proof that you will put these Copic Markers to good use. If you have any type of presence on the internet - blog, Flickr, Etsy, etc... - you will need to email me a link to your artwork, drawings, sketches, doodles, etc. This is not an art contest, and your artwork will not be judged. I just need to see the intent to use these markers. This counts as one entry. 2. You may also create an original artwork either a) using Copic products (please list or photograph the ones used), or b) make a drawing of Copic products. Upload this to Flickr, your blog, or any other photo hosting site and email me the link to the artwork. It doesn't have to be big or elaborate, but it does need to be new - not something you have already posted. This counts as one entry. 3. Write a blog post about why you want these Copic goodies titled "My Entry Into The Big May Copic Giveaway". The blog post must contain a link back to this contest post, and a link to www.penaddict.com. This counts as one entry. For each entry into this contest, you must email me at the address on the sidebar, and the subject line of your email MUST read Big May Copic Giveaway Entry. This email should contain the link to your entry, and the item number you are entering it as (#1, #2, or #3 as listed above). You can of course roll all of your entries into one blog post which contains all three elements above, and that will count as your three entries. You can have a total of three entries into this contest depending on which route you take. I will be picking the winner randomly from all of the entries. This giveaway will run for two weeks, which should provide you ample time to enter if you are so inclined. The giveaway will close on Tuesday, May 19th at 11:59 PM EST. I will post the winner shortly thereafter. It is crucial that the subject line of your email is Big May Copic Giveaway Entry, since this is how the mails will be sorted. Also, I am closing the comments on this post so as not to confuse things. If you have a question about how this contest works, please send me an email with the subject line of Giveaway Question and I will get back to you ASAP. Posted on May 5, 2009 by Brad Dowdy.